Put the date in you calendar Meirion Raynet Group will be providing radio cover for this fantastic event again this year more info will be posted closer to the time. Incorporating the 2018 ‘Welsh Super Series’. The Welsh Super Series is a newly formmatted series comprising of carfully selected events from across Wales. It will feature Wales top triathletes and competitors from further afield to compete for the newly created Welsh Super Series Title. Each stage of the Welsh Super Series will be televised across National television. 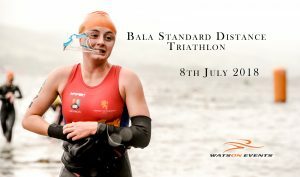 The Bala Triathlon is set in the lakeside town of Bala in beautiful North Wales. The setting is excellent with plenty of space for transition and parking at the nerby rugby club offering additional shower facilities. The swim is in Llyn Tegid,which is approximately 10miles in circumference (wet suits compulsory ).The bike section is a fast and on closed roads with beatiful scenery, while the run uses the cycle track alongside the closed road enabling competitors a view of both disciplines.